I don't tend to be a skincare "system" gal. Heck, it's a lot if I use more than one product from the same line in my nightly routine. It's not that I'm against it, but I do love to try various products and mixing and matching from different lines allows me to get a sense of each brand. But after reading about the Lancer method that is designed to transform skin and create the legendary "Lancer glow", I was willing to try it. Who am I to pass up a chance to achieve the ultimate glow? 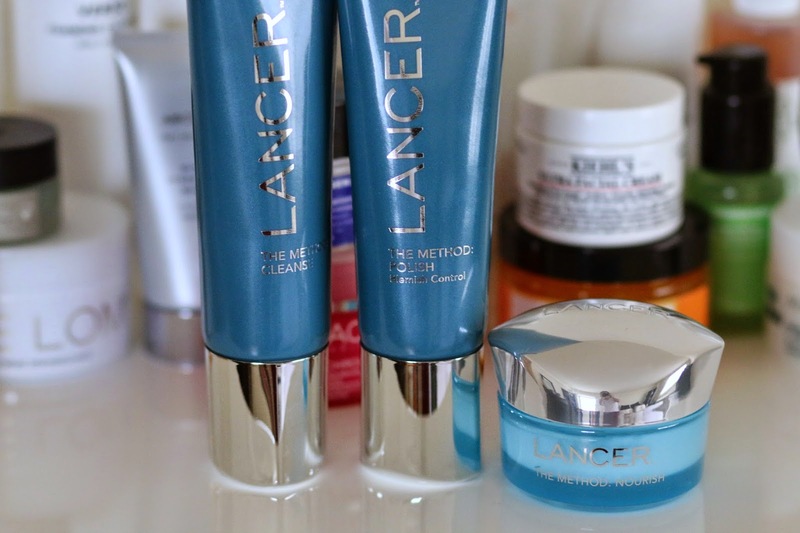 There are three products in Dr. Lancer's cult classic Method - the Polish exfoliator, the Cleanser and the Nourish moisturizer. Of course I didn't stick to only the three steps for my entire routine, but I did make these three the main staples of my routine while going through the testing phase. 1. Polish - This is the first step in the Lancer Method and may seem a bit odd to start with an exfoliator. But Dr. Lancer believes this step removes surface debris while helping infuse the skin with oxygen. Since I was not confident of it's full ability to remove my makeup, I still started with my trusty makeup wipes (currently using these and these). But immediately after, I dove right into the Polish step. As you can see from the above picture, the Polish (right swatch) is a very small granular scrub in a milky, gel base. You only need a drop to cover the entire face, but as soon as you begin working the polish into the skin it wakes you right up. It manages to be an intense yet gentle scrub that really blew most of my face scrubs out of the water. I actually stood in the mirror touching my face for a minute after because it felt as if my skin was transformed - almost as if it wasn't skin anymore. THAT is how soft it felt. I was excited to move on to the next step. 2. Cleanse - Upon initially feeling the cleanser, it has a lightweight gel texture and I was afraid it would be bubbles central (and I am not a fan of too many bubbles on my face). Thankfully, it felt a bit more like a soft milk or balm and hardly foamed on my face. The cleanser made my skin feel extremely refreshed and cool, yet after I had rinsed it off there was no sense of tightness, dryness or discomfort. The Cleanse step is designed to remove any remaining impurities and balance the skin's pH levels. My skin did in fact feel incredibly balanced and clean, and if I was stuck on a desert island with no moisturizer, my face actually would feel fine after these two steps. That's a rare feeling for me since so many times, my face is desperate for moisturizer after cleansing. It was truly a testament to how well these two cleansers worked together. 3. Nourish - The final step in the Lancer Method is the Nourish moisturizer. The texture is incredibly rich, yet oddly feels as if nothing is on your skin from the moment you apply it. My skin soaked it up immediately and what's left is balanced, soft and glowing skin. I didn't think it was possible to really see a difference with using a "system" style skincare routine, but I can't deny the results. My skin really enjoyed the three steps used together. I would still throw in an eye cream daily (currently using this essence followed by this cream) and a serum when I felt like it, but for the most part these three products did the job quite nicely. And boy did my skin glow. Like "what have you done to your skin and where can I get it" kind of glow that everyone seemed to notice. And I was all "oh this? I just woke up like this." *wink, wink* I wanted to keep the mystery going just for a bit, but I figured its selfish to keep the glow getting secrets to myself, I suppose. Have you tried the Lancer Method? What are your thoughts? Great post! Are you still using these products, and did you continue to see any additional benefits?